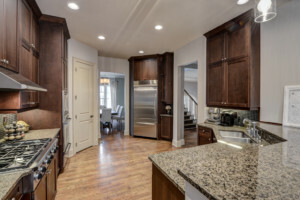 We’re experts in Brookhaven homes for sale, so we know when a RARE end unit 3BR/3.5BA townhome with a 2-car side entry garage in a gated community comes up for sale, it won’t last long! This home has all the lux touches – featuring hardwood floors, grand 2-story foyer, a large formal dining room, soaring 10+ foot ceiling on the main level, plus cozy up in the family room with gas fireplace and a deck. CLICK HERE to watch the full HD hosted video tour! The chef’s kitchen includes a Dacor 6-burner stainless steel gas cooktop, wall microwave, oven and a warming drawer for the ultimate entertainer. The kitchen also has granite countertops, custom cabinetry, under-cabinet lighting, walk-in pantry, breakfast bar and a breakfast area. 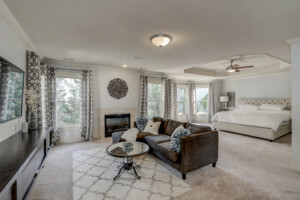 The master suite is a quiet oasis featuring a true sitting room with a gas fireplace, private balcony, spa-like master bath with a multi-head walk-in shower, oversized jetted tub, dual sink vanity and a huge wardrobe closet. The terrace level includes an office and/or guest suite to suit your needs with a full bath. The top floor includes a flex room with a wet bar, huge attic access walk-in storage area, plus a large, covered rooftop patio with a fireplace! Other luxury finishes include an Ecobee thermostat & IQ security system, plus built-in speaker system for those movie nights in! For more Brookhaven homes for sale, please check out our BROOKHAVEN PAGE with the latest listings. If you would like to see other videos of our current inventory, watch our latest VIDEO TOURS hosted by Collette McDonald.